As soon as I read the blurb for Christie Meierz's THE MARANN, I was like wow, it's THE KING AND I—in space! A story that will appeal to fans of Marion Zimmer Bradley and Zenna Henderson, The Marann recounts one woman’s journey through loneliness, shattering revelations, and attempted assassination on a world where everyone can read her emotions. Marianne Woolsey is a high school Spanish teacher in rural Iowa, when Earth Central Command decides her linguistic talents would be better exercised if she spent 26 years teaching the daughter and heir of an alien ruler on a planet 24 light years from Earth. Now she’s alone on a planet of aliens so humanlike that she has to keep telling herself her student’s noble father is just her boss. Handsome – and deadly – the Sural has ruled his province and led his planet far longer than he can admit to his daughter’s human tutor. He hides much more from the space-faring races of the Trade Alliance than he is willing to reveal. What he doesn’t want Central Command to know, he has to conceal from Marianne, but Marianne is concealing her own secrets from him – and as an empath, he knows it. This first novel in the Tales of Tolari Space series explores what could happen when you put an unsuspecting human on a planet full of empaths. Many, many years ago, I watched the 1956 version of THE KING AND I starring the oh-so-dreamy Yul Brynner. The story in a nutshell: the King of Siam hires widowed English schoolteacher Anna Leonowens (Deborah Kerr) to be the governess for his children. So it goes without saying that I was jazzed about reading an SFR with a THE KING AND I flair. In that sense, I daresay THE MARANN is the only SFR of its kind I've encountered. 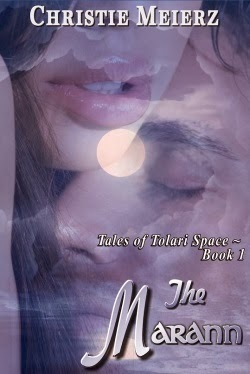 THE MARANN is the first book in the author's series Tales of Solari Space. Christie Meierz originally released it as an indie, but has since contracted it with Sky Warrior Books. THE MARANN also won the 2013 FF&P Prism award for Futuristic Romance, so that's cool! I'm going to list a few non-spoiler tags for THE MARANN. It's a heavily character-driven science fiction romance that focuses on cultural themes as well as the heroine's cultural awakening as she immerses herself in the Tolari way of life. It was a smooth read and right up my alley because of THE KING AND I flavor. Even so, I wished some elements had been tweaked a bit more. One element (no spoilers) related to the Tolari would have been even more interesting had there been a hard(er) SF explanation to accompany it. I think the element is pretty cool and wanted to learn more about it from a scientific angle (even if were only a Great BS Device). I also wished the futuristic Earth setting—or at least the heroine's perception of it--had felt less contemporary, but for me that's a minor issue since the heroine spends 99% of the story on Tolari. Your mileage on all of the above, of course, may vary. * THE MARANN could stand alone in terms of the romance, but the external plot is set up to continue. If you like subsequent books following the same couple, then this series offers that. * Because of his culture and status, hero has access to partners other than the heroine for procreation purposes (i.e., to produce an heir). This element was underplayed IMHO and I wonder if it was done purposefully because the hero doesn't come across as a rake-style hero. He's more of a family man, but one who must always consider the political. Whether it's an issue will depend on your personal taste. 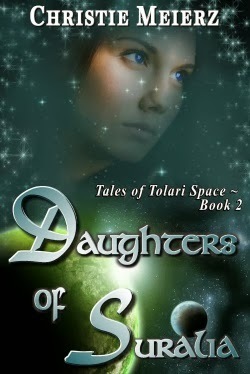 Tales of Tolari Space continues with DAUGHTERS OF SULARIA. Other planned books in the series include THE FALL and FARRYN'S WAR. Visit Christie Meierz's site for future updates.